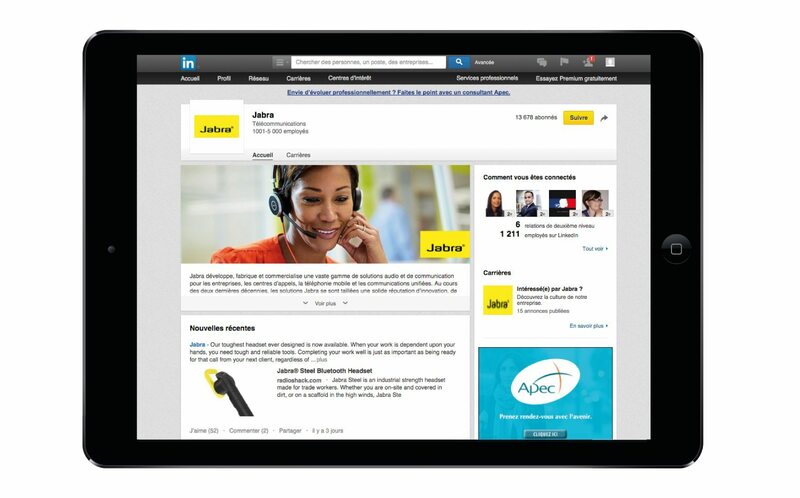 Jabra: at the heart of corporate transformation and professional uses. A new approach to help decision makers in their digital transformation and I their new working uses and generate a brand preference in a fast-changing market. While launching a major technological innovation and a new positioning on unified communication and digitalization markets, how to attract decision makers whose profiles and expectations are deeply different (CIOs, CFOs, CEOs)? How to make the teams involved in the transformation process collaborate and share knowledge and best practices in order to improve well-being and productivity at work? -how to position the brand on the unified communication market? -how to deliver relevant info to an heterogeneous target audience? -how to promote the use of headsets within professional context? -how to generate qualified and mature leads? 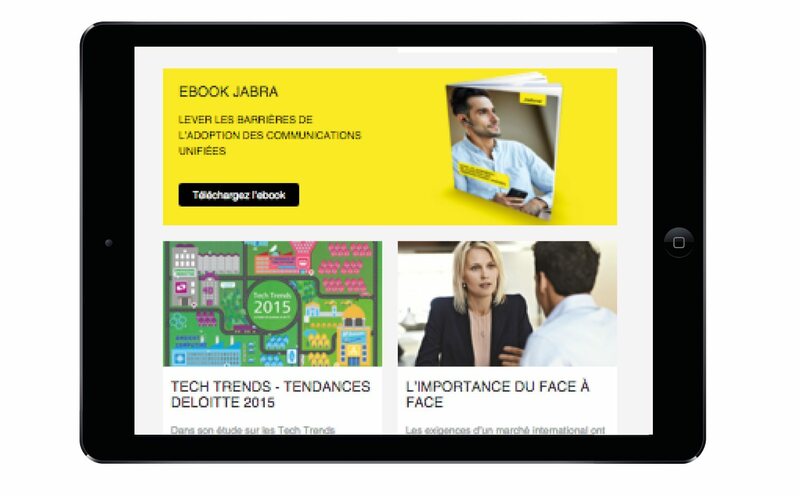 The Com’N’Collab, webzine conceived by Aressy, is a powerful way to help decision makers understand the challenges set by digital transformation and the major work environment change. It offers a large series of return of experience and expert advice. A multi-step promotion through social media is supporting the webzine traffic increasing conversation and internal team involvement. The setting-up of an Inbound Marketing strategy, based on added valor contents. 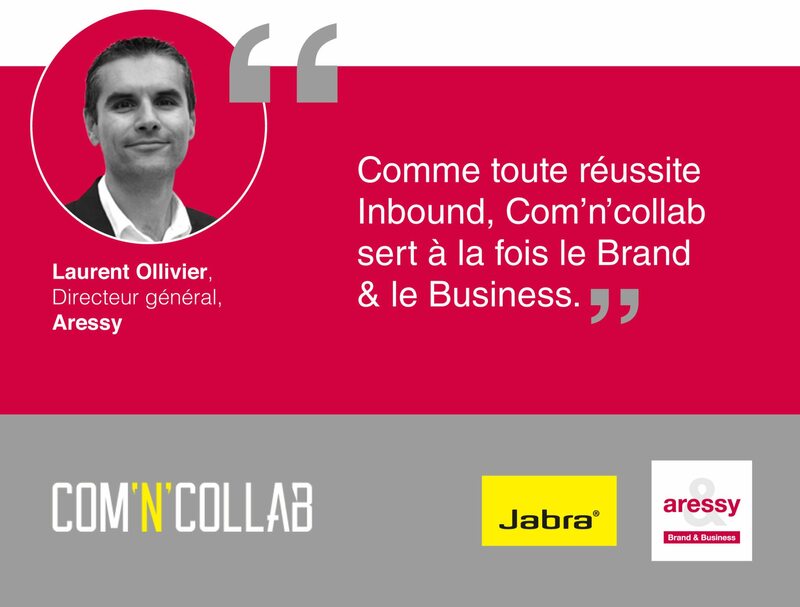 The launching of “Com’N’Collab” webzine, with Aressy, enables decision makers to understand properly the stakes concerning digital transformation and working environment changes, by giving them feedbacks and experts’ opinions. A social B2B spreading made by several steps, from promoting to conversation and internal teams rallying. A webzine reporting on collaborative work and new professional uses, through exclusive contents and weekly data curation. It is a major central meeting point for this professional transformation stakeholders, and ease new project creation and best practices. Interviews, reports, professional opinions, news give readers the opportunity to understand in a better way this transformation stakes, and to get all keys and data to make the best suited decisions in their own projects. In addition to RTB and native ads, contents broadcasting is done through social networks. LinkedIn and Twitter systematically replay every article. Working teams are trained and involved in social networks so they are active players in the strategy and rewarded by a dedicated incentive program. Subscribing to the newsletter, downloading premium content e-books and sharing on social networks, leads the target audience to be progressively engaged in the relationship with the brand. This strategy is rewarded by a large amount of qualified leads, ready to be called and to sign in for a project. By launching this Inbound strategy we bring our audience added-value contents, which empowers them in their decision process, and increase our brand awareness. To enforce image and engagement, we must strenghthen the brand positioning and relationship with the audience. Provide added-value contents and ease each one’s experience sharing are key. As every “Inbound success”, Com’N’Collab is both contributing to Brand and Business.